There were 3.7 million more people tuned in to Britain’s Got Talent than to the election debate at the same time on the BBC last week. While those viewing statistics are something of a damning indictment on the Great British public’s attention to the truly important things in life, that doesn’t matter so long as you all turn out to vote on Thursday. We live in an age where a short sharp hit of entertainment will always grip us more than any long-standing political struggle between socialism and capitalism. To that end, we have Britain’s Got Talent. After the ‘miming choir’ and Amanda Holden having breasts (which it seems no one realised until now), the British public have now turned to an odd photobomb from Simon Cowell. 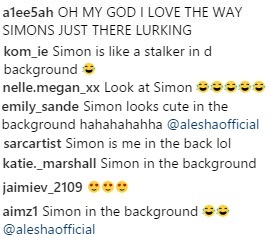 BGT fans noticed Simon lurking in the background of what was supposed to be Alesha’s glamorous Instagram post. It’s safe to say Cowell stole the spotlight as he perched in the right corner of the photo, staring into the camera. I’d love to know what he was thinking in that moment, and plenty of Alesha’s Instagram followers pointed out his blank stare. The final of the ITV talent show is tonight from 7.30pm.